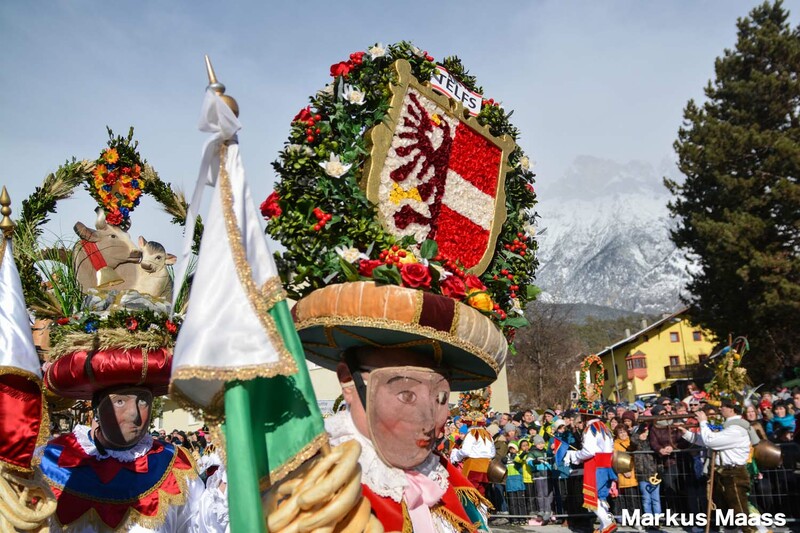 The question of which Tyrolean village can boast the oldest Fasnacht, or Shrovetide, celebrations is much disputed and documents provide little evidence as to the actual age of such customs. 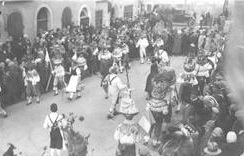 Since they originated in ancient fertility rites, however, it is my contention that these Fasnacht traditions are as old as the settlement itself. 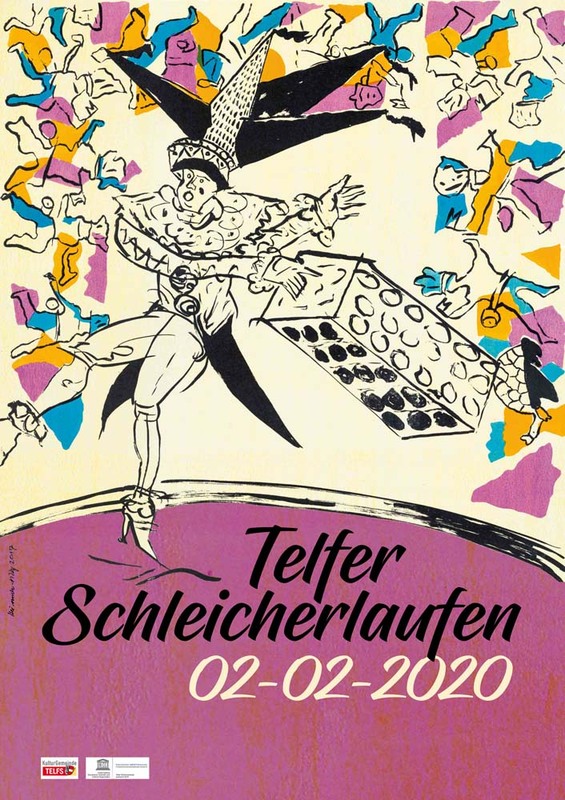 Dr. Hans Gapp dated the first documentary mention of the Telfs Fasnacht to 1571, 1612, 1749 and an exactly description of the whole Schleicherlaufen date back to 1832. Anton Haider found very important references dating back to 1621 and 1631. Schleicherlaufen is held every five years in Telfs. The feast day of St. Stephan, 26th December, signalizes the start of proceedings with a general meeting of all those involved in the event. A resolution is passed, the unanimous agreement of all being required if the Schleicherlaufen is to be held. A committee is elected, the dead are remembered, a financial report is submitted and any· necessary decisions are made regarding the procession. From now an everything in the market town of Telfs takes second place to the coming event and there can hardlv be a single family· not caught up in preparations. Many· of the participants even take leave from work at this time in order to devote more time to getting ready. Fathers, sons and brothers - only man are allowed to take part in the actual Fasnacht - are hardly to be seen, so busy· are they constrocting the displays for the various floats, making or repairing costumes or rehearsing, for in Telfs everything has to be recited by heart. The women sew, clean, darn and polish. Practically all of the town's 10.000 inhabitants are involved in some way. Now is the time to gather lichens from the trees so that it can be used for the costumes of the "wild 1men". In order to do this the boys have to climb up to the tree line at around 1.800 m. - a difficult task when the ground is covered in a deep layer of snow, as it usually is at this time. If it is thawing, the undertaking can be even more hazardous on account of avalanches. Once the lichen has been brought home, the women take over, painstakingly sewing it on to old clothes. At the same time the men in the Schleicher group are busy fashioning their elaborate hats. These are decorated with all kinds of finery, this usually having some connection with farming life and nature or, recently, even with craftsmanship or modern art. Every group has more than enough to do. The "bear baiters" have to provide a particularly large number of costumcs arid thc preparation of the various floats - these are kept secret until the eve of the big day - entails mach time arid money. On the evening of Epiphany (Twelfth night) the participants gather in the Untermarkt square for the ceremony of "digging out" the Naz, a rag doll which symholizes Carnival. The atmosphere is one of infectious gaiety arid excitement mounts es the great day approaches. 0n the day before Scbleicherlaufen Sunday the floats are revealed for the first time, giving local people the opportunity to assess their relative merits. Practicallv every float carries its own small band, liquid refreshment flows and dancing is the order of the dav. Schleicherlaufen Sunday is a day when most of the participants rise early. The "sun" has to be conducted through the market place and preparations commence at 5 a.m. when costumes have to be donned and make-up applied. Mortars are fired at 7 a.m. to proclaim the arrival of the "sun". It is preceded by a drummer in the uniform of a lansquenct and the announcer in tailcoat and top hat. Forming the rear of the group is the farmer as bearer of the sun. He is followed by an innkeeper and an artisan. At each stopping point there is a roll of the drum and the announcer recites his plea that the sun keep shining throughout the day. Then he receives a glass of wine from the innkeeper and the group move on. At 9 a.m. the "wild ones" take up their places, their main task being to act es orderlies during the procession. Covered in lichen, they wear frightening wooden masks and are accompanied by the "Panzenaff", a small person acting the part of an ape. A donkey also forms part of this group. Soon afterwards festively adorned horse-drawn carriages collect the Schleicher from their homes and take them to the assembly point. They wear a white jacket with a white ruff and bright silk knickerbockers. On their back they carry a huge cow bell. This must not be heard as they sidle along - this slinking gait is the origin of their name - but rings during their dancing movements. Their faces are covered by a youthful wire mask and they wear tall head-dresses weighing up to ten kg. and decorated with amazing ingenuity. At 11 a.m. the Schleicher group sets off, led by the heralds who proclaim the Fasnacht at every stopping point. The words they use are a modified version of a text written in 1925 by Franz Kranewitter, the Tyrolean dramatist. What would Tyrolean festivities be without a band? Naturally, this forms an inherent part of the Schleicherlaufen event and its members vary their costume on each occasion. The "four seasons" are the third group in the procession, each time of year being represented by three riders astride magnificent Haflingers. A more recent feature of the event, they· fit in well with the traditional scene. The "lantern bearer" is a conspicuous member of the procession. Belonging to the Schleicher group, he is dressed as a harlequin and his pointed cap is adorned with some 3.000 grains of maize. Despite his jester's garb, he is not a comic figure, but trips along in front of the Schleicher with a grave expression, swinging his lantern all the time. He is followed by the innkeeper, the waitress, the Glaslbua, the dairvman, dairy maid and the goatherd. They all form the inner circle for the Kroastanz, the outer circle being composed of some thirty·Schleicher who perform a special dance before certain personages. The signal for these dances of honour is given by the goatherd on his alphorn. The rhythm of the dance is dignified, the steps are slow and simple. The "Laninger group" always used to form the rear of the procession, but they now come at the and of the Schleicher group. As far back as records go they have been a traditional part of this Shrove-tide custom. Vagrant folk, they· were frequently· regarded as not being quite acceptable, but in Telfs everyone enjoys being a part of this group and the status of Laningervater or Laningermutter is actually accorded to dignitaries as a mark of honour. Eduard Wallnöfer, the late Provincial Governor of the Tyrol was made an "honorary Laninger". A bear always features in Tyrolean Shrove-tide customs and in Telfs the "bear baiters" form one of the major groups. Monkeys, camels, an elephant, a turtle and other "animals" are also a part of the throng, together with Kirghiz, Turks, Indians, Chinese and other colourful figures who bring animation to the event. One processional float now follows the other, the theme of each being kept secret until the great day. They parody recent minor and major events with coarsely humorous rhymes. Frequently these floats are regarded as a modern addition, but that is not quite correct. Floats were always a part of Shrove-tide in Telfs, although their arrangement was adapted to the times. In a way they· resemble popular assizes, mercilessly deriding various aspects of society. This kind of popular justice is encountered again and again in various forms in Tyrolean customs. In Telfs it has acquired such dimensions that one can speak of a "popular play on wheels". In Telfs and in other authentic Shrove-tide processions no respectable man is seen wearing his mask after the evening angelus. 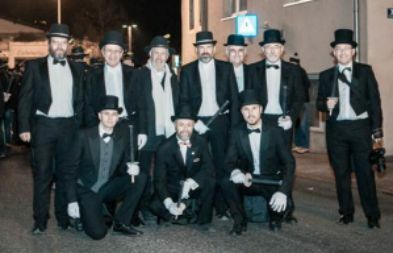 As a reward for all their efforts those taking part in the procession celebrate their very own Fasnacht next day, when the floats are auctioned. 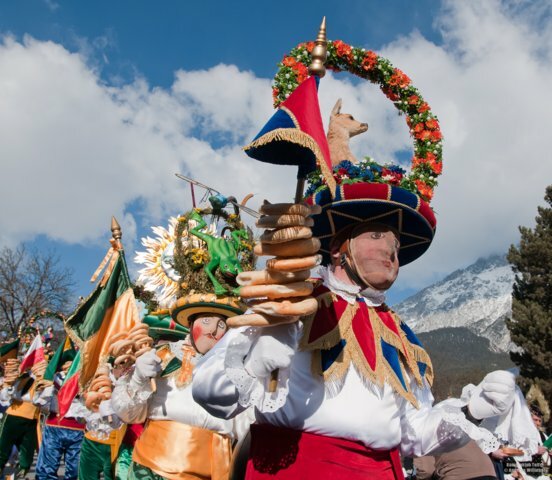 Whereas the proceeds from the Schleicherlaufen are used for charitable purposes, the income from the sale of the floats goes to the participants themselves. No one takes part for the money, however, but for the thrill of participating. Immediately prior to the Shrove-tide ball all the participants meet at the spot where the Schleicher procession starts and, holding lanterns or burning torches, they proceed to the parish church to remember former participants no longer among the living. They are neither masked not costumed, only the "latern bearer" wears bis harlequin's garb and swings his lantern. Thus the past is ever-present in this youthful festivity. At the end of Shrove-tide the participants again assemble in order "to bury the Naz". The Laninger play the main part, as they· did when this symbol of Carnival was dug out. The "land register clerk" and his assistant have to keep a precise record of the burial spot. It will be needed again five vears hence, when Telfs is again caught up in the spirit of Schleicherlaufen. Dr. Friedrich HAIDER, born 1921 in Pettnau, read History, Geography, Folklore and History of Art at Innsbruck University. After graduatinq he worked for various newspapers before moving to broadcasting, his profession for over 30 years. A qreat expert of Tyrolean customs, Dr. Haider has made these the subject of numerous articles, radio programmes and books.